Could Driverless Cars Eliminate Car Accidents? Each year, thousands of Alaskans—and hundreds of thousands of Americans in total—die in car accidents. Most of these accidents are completely preventable. They occur because the driver was distracted, drunk (a common problem in our area), or driving aggressively. The nation’s lawmakers and law enforcement have been cracking down on traffic offenders for the safety of the public. They ticket people who don’t wear seat belts and who text behind the wheel. They harshly punish people who have been driving drunk. Unfortunately, making mistakes is human—which means it’s unlikely that we will never get the number of car accidents in the U.S. down to zero. Unless, however, we get rid of the driver. What seems like science fiction could soon be a reality: Google is working to build prototypes of a truly driverless car. In recent years, Google has built a self-driving car by tweaking already existing models (though a “safety driver” was present in the front seat). These cars have logged thousands of miles on California roadways. But the new prototype—a subcompact car—wouldn’t have a steering wheel or gas or brake pedals. The car would use sensors and computers to drive itself. The passenger would push a button to start the car and would set a destination by typing or voice command. The electricity-powered car would be able to go 100 miles between charges. It would have a maximum speed of 25 mph. 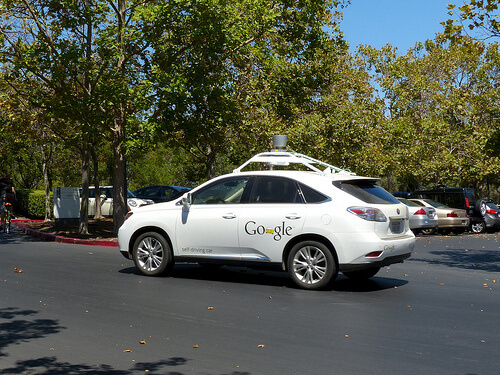 Google’s foray into self-driving vehicles represents a shift in the marketplace. While, to date, cars have safety features like lane assist, helping people stay in their lanes, the expectation has always been that the driver will jump in if trouble arises. Currently, lawmakers are struggling to keep up with the technology. If self-driving cars become a reality, this could prevent millions of injuries and deaths over several years. However, this reality might be fairly far off, particularly in Alaska. Google’s tiny subcompact car would not be practical in the inclement weather that Alaskans experience. A self-driving car would need to work both in the summer and in Alaska’s harsh winters—surviving the cold, ice, and snow. If Google or another company invents a self-driving truck, Anchorage might get on board.